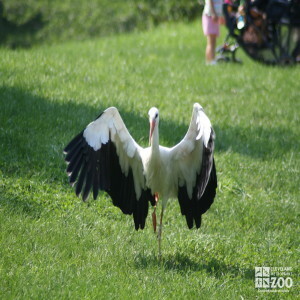 The range of the white stork is Europe, Asia, and Africa. White storks inhabit swamps and river valleys with adjacent agricultural areas. White storks generally feed while walking, prey being seized with a beak thrust or taken sideways when the beak is under water. These storks migrate from Europe and Asia to Africa in the fall and return when the northern spring approaches. Their flight paths lie along the coasts of the Mediterranean. The white storks reach their nesting sites in late March or early April and nest on chimneys, usually one previously used. Europeans often supply wicker baskets for the birds in belief that the birds bring good fortune. A pair of white storks may breed together for many years. The nest is not completed the first year but is added to annually with rags, clothing, newspapers and even horse manure until it becomes a veritable round tower, reaching a height of 6 feet and a width of 4 feet. Copulation takes place on the nest during construction or repair. Young leave the nest at 2 months of age and quickly become independent.